We’d love your help. Let us know what’s wrong with this preview of Mrs. de Winter by Susan Hill. From the very first moment of Rebecca ("Last night I dreamt I went to Manderley again"), readers were immersed in the claustrophobic world of Maxim de Winter, his innocent child bride, and the memory of the malevolent beauty, Rebecca. At the end of Rebecca, Manderley is burning and Maxim and Mrs. de Winter are on their way to the Continent to try to build a quiet, safe life From the very first moment of Rebecca ("Last night I dreamt I went to Manderley again"), readers were immersed in the claustrophobic world of Maxim de Winter, his innocent child bride, and the memory of the malevolent beauty, Rebecca. At the end of Rebecca, Manderley is burning and Maxim and Mrs. de Winter are on their way to the Continent to try to build a quiet, safe life for themselves away from the passionate, violent excesses that nearly destroyed their souls. But could this be possible? Could the de Winters escape or did they ever return home to England to confront the past? What, for that matter, happened to the despicable housekeeper, Mrs. Danvers, and Rebecca's creepy cousin, Jack Favell? Susan Hill, a distinguished novelist writing at the top of her form, has imagined brilliantly, and wholly convincingly, precisely what happens after the de Winters journey back to England. Daphne du Maurier would approve; so too will innumerable readers of Rebecca, and the huge number of people who appreciate the joining of a great novelist to a wonderful story. Published 1993 by William Morrow and Co.
To ask other readers questions about Mrs. de Winter, please sign up. This answer contains spoilers… (view spoiler)[ Mrs. Danvers sent the flowers and signed the card "R". After all, she considered it her mission in life to keep Rebecca's memory alive. It makes sense…more Mrs. Danvers sent the flowers and signed the card "R". After all, she considered it her mission in life to keep Rebecca's memory alive. It makes sense the exquisite flowers arrived late because Mr. Danvers would have had to read the Beatrice's obituary first and send flowers later. If you love the original Rebecca do yourself a favor and stay away from this book. Susan Hills kills a good mystery. How dare she destroy such a beloved novel! She does an injustice to the characters and its a bore. She ruins the tale of Maxim and the late Mrs. De Winter. It starts poorly, continues poorly and ends horribly. I wish there could be an invention to erase it from my memory. It took everything out of me not to tear the book up and set it on fire. But that would mean I would have to p If you love the original Rebecca do yourself a favor and stay away from this book. Susan Hills kills a good mystery. How dare she destroy such a beloved novel! She does an injustice to the characters and its a bore. She ruins the tale of Maxim and the late Mrs. De Winter. It starts poorly, continues poorly and ends horribly. I wish there could be an invention to erase it from my memory. It took everything out of me not to tear the book up and set it on fire. But that would mean I would have to pay for it since it was a library book. Susan Hills demolishes your personal perception of the De winters life after Manderly. If you want to know what happens to the De winters you are better off writing your own story no one else's sequel would satisfy you. Unless of course if there was a sequel written by Daphne du Maurier herself. That’s the only exception to this. "Nu mai era, însă, la fel de categoric acum, sau la fel de impulsiv; devenise mult mai calm, mai răbdător, mai ales față de plictiseală. Se schimbase. Și totuși, privindu-l acum, îl vedeam la fel ca atunci când îl cunoscusem, era același Maxim. Ar fi trebuit să fie o seară ca toate celelalte petrecute împreună, vorbind despre fleacuri, simpla mea prezență îl liniștea și era dependent de mine, obișnuită de-acum să fiu eu cea puternică." "Odată, când nu aveam ceva mai bun de făcut, îi scrisesem o s "Nu mai era, însă, la fel de categoric acum, sau la fel de impulsiv; devenise mult mai calm, mai răbdător, mai ales față de plictiseală. Se schimbase. Și totuși, privindu-l acum, îl vedeam la fel ca atunci când îl cunoscusem, era același Maxim. Ar fi trebuit să fie o seară ca toate celelalte petrecute împreună, vorbind despre fleacuri, simpla mea prezență îl liniștea și era dependent de mine, obișnuită de-acum să fiu eu cea puternică." So incredibly boring & tedious & depressing. Having read the original, I didn't expect the narrator to have taken kickboxing lessons from Wonder Woman, but jaysus -- could this chick possibly be more bland & lacking in page presence? I doubt it. This is 10+ years since REBECCA ended. The author could have used that gap to indicate *some* kind of growth on the narrator's part, but no -- instead she's STILL wearing boring, f NOPE. So incredibly boring & tedious & depressing. Having read the original, I didn't expect the narrator to have taken kickboxing lessons from Wonder Woman, but jaysus -- could this chick possibly be more bland & lacking in page presence? I doubt it. This is 10+ years since REBECCA ended. The author could have used that gap to indicate *some* kind of growth on the narrator's part, but no -- instead she's STILL wearing boring, fugly clothes, refusing to let herself be anything but unworldly & timid, pinching pennies & judging rich folks, stumbling around in Max's wake (literally) because...? There is NO REASON for this except the author was desperate to maintain the status quo. Odd, that, given how she (i.e., the author) kills Beatrice in the first chapter, thereby snuffing out a key component of light & sanity in the original, & then bookends the misery by killing Max in the last 5 pages. Please take a moment to let that sink in. Max is killed. Off-page. In a car wreck that serves no purpose. I know this because I read the final chapters. It must take a brave author to do a follow on book to Daphne Du Maurier’s ‘Rebecca’, but this is what Susan Hill has done. I think Rebecca was calling out for a sequel though – when I read the book I kept looking for more pages to read, the ending was so underwhelming. • She was brilliantly able to emulate Du Maurier’s sensuous and sensitive descriptions of people, countryside and houses.....and this was a joy. • Similarly, she was able to continue It must take a brave author to do a follow on book to Daphne Du Maurier’s ‘Rebecca’, but this is what Susan Hill has done. I think Rebecca was calling out for a sequel though – when I read the book I kept looking for more pages to read, the ending was so underwhelming. •	She was brilliantly able to emulate Du Maurier’s sensuous and sensitive descriptions of people, countryside and houses.....and this was a joy. •	Similarly, she was able to continue Du Maurier’s atmosphere of gothic suspense. I personally find this style too theatrical, too unrealistic and camp – but she was true to the original author so the continuity was good. •	Her ending was an improvement on the original ending. There was a lot more closure, and I found it more satisfactory. Well, there was only one bad point, but it was pivotal, and influenced everything in the book. In 'Rebecca' there are two sides shown to our nameless heroine. In the first part of the book she is drippy, drippy, drippy, and any sympathy you may feel for the her situation is steamrollered by her endless references to poor inadequate me. In the second part of the book she picks up, and becomes a lot more feisty. This remodeled, stronger heroine is tons more attractive, and the book generally became a lot more gripping. I think a lot of this hinged on the heroine bucking up her ideas. So, what did Susan Hill do in the sequel? She chose to make our heroine revert to drippy, drippy, drippy mode. Agggggh! How could she have done that! For me, the flabbiness and negativity of the narrator was a continual irritation, and it undermined the momentum of the story to a degree that was seriously off-putting. Having said that, I admire Susan Hill for having a go. I think Rebecca was crying out for a better ending, and Hill’s ending was an improvement on what was there before. A follow up to Daphne du Maurier's classic, Rebecca. Mrs. de Winters, however, falls short of everything. It just isn't compelling enough to read other than to find out what happens to the de Winters after Rebecca . I can't even remember much of the plot. Plus the characters seem dry and tired, as if all that they want to do is rest and be forgotten. I've seen a lot of criticism for this novel that I believe is for the most part, rather exaggerated. I understand that no sequel to 'Rebecca' will ever compare to the original - after all, du Maurier's method of crafting such a fragile narrative and use if descriptive language I stunning. I adore 'Rebecca' - it is possibly my favourite book of all time, and will likely always be up there in my favourites. Elements of 'Mrs De Winter' seem perhaps too fast-paced or unrealistic, yet it must be note I've seen a lot of criticism for this novel that I believe is for the most part, rather exaggerated. Elements of 'Mrs De Winter' seem perhaps too fast-paced or unrealistic, yet it must be noted that Susan Hill doesn't really stray from the implications of the original plot a great deal. The continued reference to age and growth echoes that of the narrator in du Maurier's novel, and the prejudices and actions of the characters are not exceedingly out of character. I've taken extensive notes on this book as I am currently studying 'Rebecca' at AS level, and I think that many of the implied points in this sequel provoke interesting conclusions that I would have otherwise overlooked. Therefore, this book must be looked upon as simply a new interpretation of du Maurier's classic; I do not believe that it seeks to overwhelm the beauty of the original. It instead effectively explores the characters, setting, and plot in greater detail, providing a pleasurable and inspiring reading experience for those who have a deepened interest in du Maurier's work. As if Rebecca wasn't bad enough, we had to have someone come along and write a sequel that was equally bad, if not worse in some parts. Even my mother who loved Rebecca disliked this. Blech. Però non mi è piaciuto, con questo libro ho capito che la peculiarità della Du Maurier è lasciare piccoli o grandi dubbi, che devono rimanere irrisolti. Ho davvero apprezzato invece i libri originali di Susan Hill, dei romanzi gotici davvero intriganti. I was looking in the library for a Daphne du Maurier book to take on holiday to Fowey, as that's her home town and I remembered from a previous visit that I'd probably be overcome with the urge to read her work while I was there and thought I'd go prepared. None of the du Mauriers in the library appealed to me but I spotted this instead and decided it would fit the bill nicely. It's a sequel to du Maurier's most famous book Rebecca. This book is narrated again by Maxim de Winter's second wife who manages not to use her own first name again and it is set a decade or so after the events at Manderley. It also covers ""what happened next"" to several other characters - the only one I recalled was Mrs Danvers. Indeed I read Rebecca so long ago that I can only remember the vaguest details - but all the same I thought this was a good read and it seemed plausible enough. I'm going to go and have a look around the web and see what real du Maurier fans thought of it. I enjoyed it though which is all I want really! Terrible. I looked forward to reading a sequel to "Rebecca," but I was horribly disappointed by this. Maxim comes off as a total wimp, and the new Mrs. DeWinter just panders to him and treats him like a baby. They spend the whole book running around flailing for no good reason, but never stop to talk to each other about it. The ending is worst of all. I absolutely loved Rebecca by Daphne du Maurier, and wished there was a sequel. So when I learned one had been written, I picked it up. It was not only nothing like what a sequel to Rebecca SHOULD have been, it was horrible writing, and the horrid unreadable font in the copy I had was so bad I couldn't even concentrate on the story. This should never have been written. I had high hopes for this book, as I had loved "Rebecca" so much, but I was quite disappointed. It seemed to drag on, and was quite slow through the majority of the book. The ending got exciting, but only to finish the story off on a low note. I do not recommend....especially to those who enjoyed "Rebecca." I suggest you keep whatever happy ending you envisioned for Maxim and Mrs. De Winter, and NOT read this book! A perfect sequel to Rebecca - I kept having to remind myself that this novel was not by Daphne du Maurier herself, it was so well written. It is the same unnamed protagonist, 10 years later, she and Mr. de Winter return after seemingly aimlessly wandering from one foreign destination to the next, for the funeral of Maxim's sister, Beatrice. 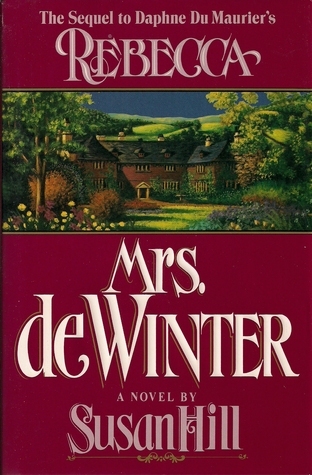 They spend some more time traveling around the UK and decide to stay, when Mrs. de Winter falls in love with a property in the countryside, away from what rema A perfect sequel to Rebecca - I kept having to remind myself that this novel was not by Daphne du Maurier herself, it was so well written. They spend some more time traveling around the UK and decide to stay, when Mrs. de Winter falls in love with a property in the countryside, away from what remained of Manderly. She is consumed with desire for this uninhabited estate, just as Daphne du Maurier was attached to Menabilly, the property in real life, where she renovated and lived, but never owned. They still have enemies, real and imagined, that torment them. It's not so much action, but inner turmoil, that causes an unending sense of dread throughout the book. I don't want to give away the ending, but it seemed a perfect way to make sense of everything that happened from the beginning of Rebecca to the end of the Mrs. de Winter book. I had high hopes, at first, for this posthumous sequel to Daphne du Maurier's Rebecca. There are beautifully crafted bits of description early on, and the main characters seemed true to their original natures. Indeed, Maxim remains so. But the narrator (still unnamed, I believe), whose awkward cluelessness made some sense in the original novel, soon started to grate on me. After maturing somewhat by the end of Rebecca, and taking a less passive role in her subsequent married life, she reverts to I had high hopes, at first, for this posthumous sequel to Daphne du Maurier's Rebecca. There are beautifully crafted bits of description early on, and the main characters seemed true to their original natures. Indeed, Maxim remains so. But the narrator (still unnamed, I believe), whose awkward cluelessness made some sense in the original novel, soon started to grate on me. After maturing somewhat by the end of Rebecca, and taking a less passive role in her subsequent married life, she reverts too readily and (almost) completely. I also have little patience with authors who require their characters to be oblivious to the obvious, as the narrator is for much of the novel. There is also a good deal of heavy-footed forecasting of vague but impending doom -- though Hill does keep us guessing fairly effectively, at times, as to its details and timing. Continúa donde acabo Rebeca. Alargando innecesariamente la historia. Tiene poco interés lo que sucede, tan solo recrearse de los paisajes y viajes narrados en primera persona. Hill escribe bien, te mete en su mundo casi físicamente. Pero peco en la poca originalidad de sus historias. No se puede ser perfecta. How can you follow Rebecca? Susan Hill writes a good ghost story. I was curious as to how she would do this. Not perhaps the ending I had expected but very well written. My love is still Rebecca which must be due for a re-read! If you take out Mrs De Winter's description of the weather and the birds, this book would have 6 pages - duller than dirt. Loved this superb sequel to Rebecca. Written in a way surely du Maurier would have approved. Entirely satisfying. I must say that SH has written a little gem - perfection in writing; beautifully written prose capturing the period in atomsphere, language, speech, attitude, manners, matter, structure, class, clothing, style, absolutely everything down to the kitchen sink, in both writing and social history. However, I felt for this mega massive achievement there was no real story to get my teeth into. Instead, it waffled on for beautifully written page after beautifully written page, indulgent chapter after i I must say that SH has written a little gem - perfection in writing; beautifully written prose capturing the period in atomsphere, language, speech, attitude, manners, matter, structure, class, clothing, style, absolutely everything down to the kitchen sink, in both writing and social history. However, I felt for this mega massive achievement there was no real story to get my teeth into. Instead, it waffled on for beautifully written page after beautifully written page, indulgent chapter after indulgent chapter, getting absolutely nowhere fast. I lived in the brilliant head of Joan Fontaine for ages but there was nothing more to learn from the first chapter really. Whether I had read DdeM would, of course, made a huge difference I have no doubt. 3.5 stars actually, but I wanted more than three stars to show. This is my 2nd Susan Hill book, and I'll be going in for a third, and then some. I've fallen in love with her writing style, elegant but not over-flowery. I got 2/3 through before I began to have quiet whispers of doubt. And even though the finale ended a bit too quickly for me, I think it's a well-rounded story, not without a bit of sadness and disappointment. This book was a total disappointment. I skipped large swaths of it without missing a thing. It finally looked like it would pick up a little near the end but, alas, no. Even the appearance maybe excitement was a disappointment. This sequel was unnecessary, but as far as unnecessary sequels not written by the original authors go, Susan Hill did a fairly good job in matching Daphne du Maurier's style and tone. On October 9, 1993, Natasha Walter of the Independent newspaper wrote a review of Susan Hill's MRS. deWINTER, a just-published sequel to Daphne DuMaurier's gothic romantic thriller REBECCA (1938). Walter called her review "Dreaming of Manderley again" and said loudly and clearly that she found Hill's novel "timid"...for much like second wives, sequels often do little to endear themselves to friends or fans of the original. "Last night I went to Manderley again. I peered through the gates, heart beating with anticipation, but instead of grand lovers playing out their romantic struggles, I saw two middle-aged chaps in a Gloucestershire garden having a squabble. I left as soon as I could, but it will never seem the same again." The reviewer echoes the many voices of Amazon reviewers who wished they had never read the sequel. But this reader found some redeeming points, just a few. For one, the author of the sequel is one award-winning and prolific British writer, Susan Hill. Hill captures the voice of the narrator of the original by using the second Mrs. deWinter as her narrator. Still demure, unsophisticated, and in love with a handsome man she met in Monte Carlo over ten years ago. Hill opens MRS deWINTER with a funeral in a Gothic tone..."The undertaker's men were like crows, still and black, and the cars were black, lined up beside the path that led to the church; and we, we too were black, as we stood in our pathetic, awkward group waiting for them to lift out the coffin and shoulder it, and for the clergyman to arrange himself; and he was another black crow, in his long cloak. And then the real crows rose suddenly from the trees and from the fields, whirled up like scraps of blackened paper from a bonfire, and circled, caw-cawing above our heads..." Max and his second wife have returned to England after ten years abroad for the funeral. And just when Mr. and Mrs. deWinter seem to have found a new life in a lovely home called Cobbett's Blake, in a part of England far from the sea sheltered by the thin, high ridge of the Cotswold hills, the story rushes toward a fatal ending. The denouement, such as it is, comes after a garden party at the new home. Throughout this sequel, the Independent reviewer tells us "Rebecca's remaining lovers will feel like Mrs Danvers - dour, uncomprehending, and dismissive of the newcomer's ineffective attempts to please. The peace of Manderley, they will mutter, should never have been disturbed. We only wanted to dream about going back." But this reader enjoyed going back. If only to relive the happier times of Max and his nameless second wife. I would have been very pleased with a final scene of the deWinters at Cobbett's Blake in front of a fireplace with Jasper, the new labrador, lying by his master's chair. Susan Hill was born in Scarborough, North Yorkshire in 1942. Her hometown was later referred to in her novel A Change for the Better (1969) and some short stories especially "Cockles and Mussels". She attended Scarborough Convent School, where she became interested in theatre and literature. Her family left Scarborough in 1958 and moved to Coventry where her father worked in car and aircraft factor Susan Hill was born in Scarborough, North Yorkshire in 1942. Her hometown was later referred to in her novel A Change for the Better (1969) and some short stories especially "Cockles and Mussels". She attended Scarborough Convent School, where she became interested in theatre and literature. Her family left Scarborough in 1958 and moved to Coventry where her father worked in car and aircraft factories. Hill states that she attended a girls’ grammar school, Barr's Hill. Her fellow pupils included Jennifer Page, the first Chief Executive of the Millennium Dome. At Barrs Hill she took A levels in English, French, History and Latin, proceeding to an English degree at King's College London. By this time she had already written her first novel, The Enclosure which was published by Hutchinson in her first year at university. The novel was criticised by The Daily Mail for its sexual content, with the suggestion that writing in this style was unsuitable for a "schoolgirl". Her next novel Gentleman and Ladies was published in 1968. This was followed in quick succession by A Change for the Better, I'm the King of the Castle, The Albatross and other stories, Strange Meeting, The Bird of Night, A Bit of Singing and Dancing and In the Springtime of Year, all written and published between 1968 and 1974. In 1975 she married Shakespeare scholar Stanley Wells and they moved to Stratford upon Avon. Their first daughter, Jessica, was born in 1977 and their second daughter, Clemency, was born in 1985. Hill has recently founded her own publishing company, Long Barn Books, which has published one work of fiction per year. Librarian's Note: There is more than one author by this name.